The first time ever I saw her face the microphone was live, her lips pressed close as she leaned her body forward from her chair as if speaking to a single person – breath to ear – even as thousands eavesdropped over the airwaves. Her eyes never lifted to acknowledge my interruption in her control room. If they did pierce me in that moment she would have seen me melting in the glow of her face. 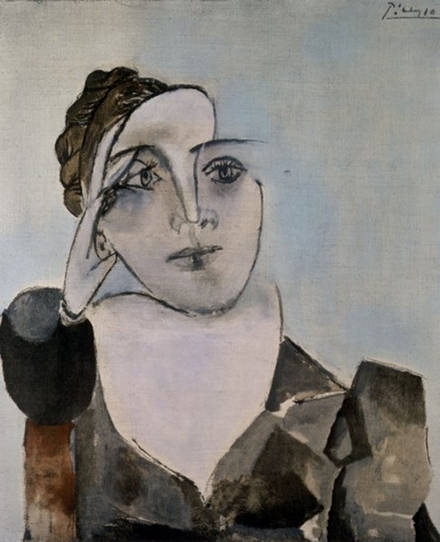 Picasso would have known what to do with such delicate features juxtaposed as they were against a punk-rock foreground. My gaze followed swatches of dark green streaks in her hair. They flowed like mossy rivulets into the speckled green galaxies in her eyes. Her punk facade deterred pretenders from treading too close and a tight circle of gay friends kept her enclave safe from machismo contenders. There were also moral issues. We were professional colleagues, so anything more than cordial was inapt. Still, none of these carefully constructed or convenient defenses could discourage my reckless crusade to win a heart. With wide-eyed, late twenties exuberance and no regard for trivial and arbitrary workplace opinion, I befriended her. I became a genteel tide washing up to her fortified walls, but no amount of chivalry could breach her gates, or garner her full attention. That was left to a power far greater than I. God was busy, but his blood came in handy. Red wine: the serum of persuasion. Staff parties encouraged copious use and under its spell her walls came crashing down. She was vulnerable; I became a safe place to wait out the storms. Her trust drew me close and in time her gates opened to invite me into the deep green garden in her eyes. This is where I longed to live. She was a rare find, a flee-market painting layered over the sumptuous lines of a priceless masterpiece. Behind her leather was satin and silk, behind the spiky façade, a soft, delicate girl. Stripped of the harsh crust that kept the world from taking notice emerged a beautiful woman: vulnerable, educated, sensitive, compassionate and ardent. Years passed beautifully between us. We never once fought, never tore each other down or held the other to standards dictated by social decorum or religious doctrine. We never discussed marriage, never lived common-law, never spoke of family of our own or of white picket fences. We were liberal thinkers, or more honestly, too scared and immature to ponder the awesome responsibilities and sacrifices of domestic bliss. We were a well fitted sweater that one-day snagged on something unseen. We pulled at the imperfections until it became impossible to mend back to new. Warm, safe and comforting became frayed from change. Jobs changed, geography changed, we changed and love changed its mind to friendship. Bernard Shaw once quipped, “Youth is wasted on the young”; “love”, I discovered, “is wasted on callow hearts”. Chris, I am sure I have said this before but I will say it again. You write so beautifully. I really enjoy reading your posts. Thank you Cari-Lee. It’s a labour I love and to know it communicates is very humbling. Chris has been extremely generous with me. It’s lovely to know you have been loved. And our friendship continues to grow.